This post is inspired by a recent Buzzfeed article I read called 31 Things to Do with Confusing CSA Vegetables. Thank you, Rachel Sanders, for so humorously offering a solution to the absurd CSA-induced panic that plagues us when presented with these foreign and inexplicable vegetables. “What if I’m scared of these creepy GARLIC SCAPES?” she asked, yanking the question straight from my head as I stared blankly in fear at these curling, serpentine green garlic stems. Rachel then proceeds to go through garlic scapes 101 in what I can only interpret as enthusiastic yelling. TELL ME WHAT THEY ARE! The above-ground central stalk of a garlic plant. TELL ME WHAT THEY TASTE LIKE! A very gentle, fresh, slightly spicy garlic…garlic scapes are mild enough that you can eat them straight up without experiencing mouth pain or hours of stinky breath. Texturally, they’re like firm, crunch scallions. TELL ME WHAT TO DO WITH THEM! 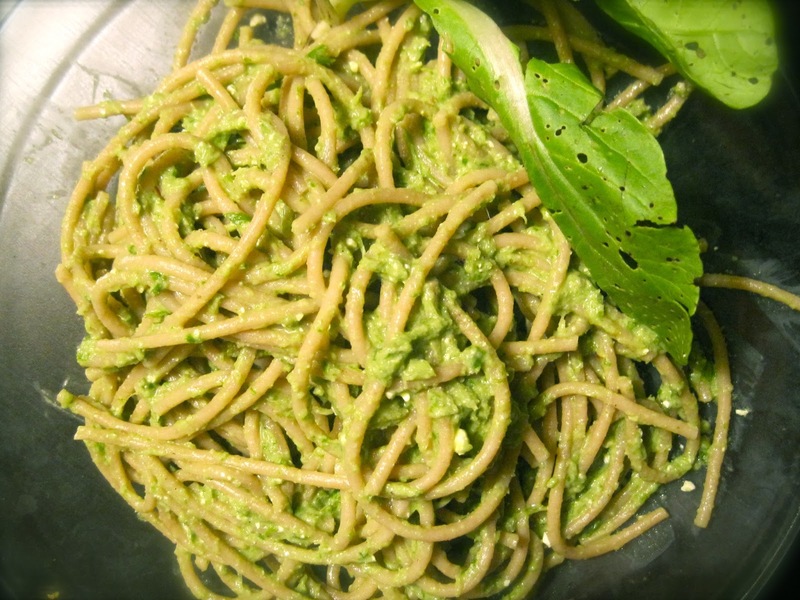 Rachel suggests Pasta with Garlic Scape Pesto. No longing fearing the garlic scape and excited about the prospect of a less-intense garlic, I happily oblige. Actually, this is really Garlic Scape-Sorrel-Tat soi-Pak choy-Parsley Pesto, since sorrels and an "Asian Green" mix comprised of Tat soi and Pak choy were featured abundantly in my weekly CSA. Texturally resembling a spinach leaf but standing apart with it's tart, lemony flavor, the sorrel is a delicate leafy green that shines upon cooking (heat exposure reduces the oxalic acid content, which in turn softens the tartness.) Since Rachel recommends swapping half of the garlic scapes for another leafy green like basil or arugula, I decided this was the perfect place to utilize all my extraneous CSA greens. The result was an extremely "green" tasting pesto. I loved it, but if the sight of a green juice makes you balk, this is probably not the recipe for you. The pungent greens are tempered with familiar zesty lemon, olive oil, Parmesan and lots of salt & pepper, yet still retain a stand-apart fresh, earthy taste from your regular pesto. The toasted nuts combined with the thick garlic scapes create the perfect crunchy texture. I added roasted grape tomatoes and grilled chicken too. 1. Toast the nuts. In a dry pan over low heat, add nuts and toss occasionally until just beginning to brown, about 2-3 minutes. (Keep an eye on these, as they can go from "browned" to "burnt" very quickly!) Remove from heat and let cool for a few minutes. 2. Prepare pasta. Cook until al dente, according to package directions. 3. Make the pesto. Puree the garlic scapes, nuts, lemon juice & zest, and generous sprinkle of salt & pepper in a blender or food processor * (If you want to soften the bite of the scapes and sorrel, boil for a few minutes before adding to blender.) With the blender motor running, slowly add olive oil. Transfer pesto to bowl and fold in grated cheese, and more salt & pepper to taste. 4. Drain pasta. Reserve 1 cup of pasta-cooking water, and combine with pesto; starting with 1/4 cup and increasing slowly until desired consistency is reached. Toss with pesto, and serve immediately. *My blender had a difficulty time pureeing these tough stubborn greens, so I had to add some of the pasta water from step 4 for more liquid. If you have the option of using a food processor, I recommend going for that over a blender.